The TY91 and TY92 radios provide light sport and general aviation pilots with a compact, fully certified 25kHz / 8.33 kHz VHF radio. The Trig TY91 and TY92 take up minimal space and weight. The use of a control head and separate radio hardware unit provides more installation options, especially when space is at a premium. The control head can be conveniently mounted in a standard 57mm round hole or even smaller compact mount. Fitting is straightforward, and once installed the depth of the radio control head is only 74mm. In practice this means that the Trig TY91 and TY92 control head can be located in an aircraft instrument panel where a ‘single box’ radio will simply not fit. 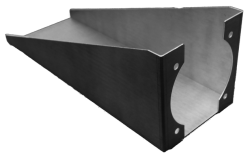 The Trig TY91 takes up minimal space and weight. 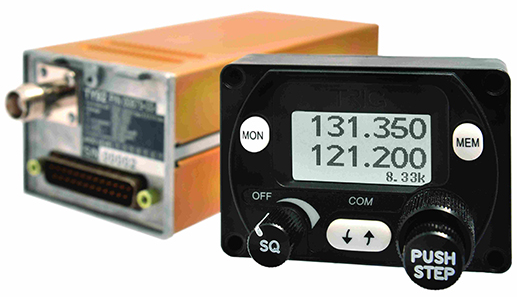 With a crisp clear display (with manual dimming) and simple user interface the Trig radio benefits from some great features; ‘Dual Watch’ allows the monitoring of two frequencies at the same time. There are 9 pre-set channel memories which are all easily selectable. The radio can integrate with popular GPS units; this allows the automatic display of on route radio frequencies (uses industry standard SL40 protocol). The radio also has a built-in two place intercom with an aux-input, saving further cost and weight.